Michael Sorkin is one of the most forthright and engaging architectural writers in the world. 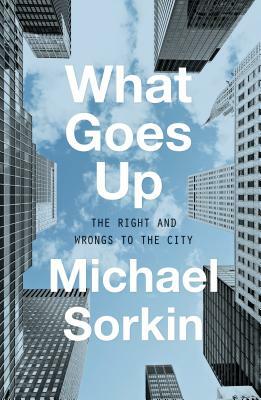 In What Goes Up he takes to task the public officials, developers, “civic” organizations, and other heroes of big money, who have made of Sorkin’s beloved New York a city of glittering towers and increasing inequality. He unpacks not simply the forms and practices—from zoning and political deals to the finer points of architectural design—that shape cities today but also offers spirited advocacy for another kind of city, reimagined from the street up on a human scale, a home to sustainable, just, and fulfilling neighborhoods and public spaces. Informing his writing is a lifetime’s experience as an architect and urbanist. Sorkin writes of the joys and techniques of observing and inhabiting cities and buildings in order to both better understand and to more happily be in them. Sorkin has never been shy about naming names. He has been a scourge of design mediocrity and of the supine compliance of “starchitects,” who readily accede to the demands of greed and privilege. What Goes Up casts the net wide, as he directs his arguments to students, professionals, and urban citizens with vigor, expertise, respect, and barbed wit. Michael Sorkin is an award-winning architect, Distinguished Professor of Architecture and Director of the Graduate Program in Urban Design at the City College of New York, as well as President of the non-profit architecture and urban think tank Terreform. In 2010, he received the American Academy of Arts and Letters award in architecture and, in 2013, the National Design Award in the Design Mind category. For ten years, Sorkin was architecture critic for the Village Voice; he is currently the critic at the Nation and writes regularly for Architectural Record and the Architectural Review. His books include Exquisite Corpse, Some Assembly Required, Twenty Minutes in Manhattan, Wiggle, and All Over the Map.